Shipka, Bulgaria - 17 Boyan Chomakov Str. Hotel Perenika has four rooms able to sleep two-to-three people, as well as an additional apartment sleeping up to four. 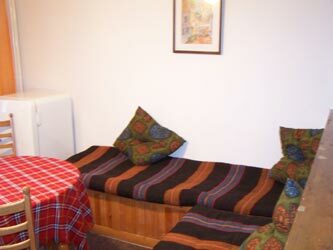 The apartment is furnished in traditional Bulgarian style and includes a living room and fully equipped kitchen. All rooms are ensuite and include cable/satellite television. Whether you wish to have an active holiday filled with excursions, or a more leisurely trip simply taking in the beauty of the area, the good climate and fresh mountain air of Shipka ensures relaxing holidays throughout the year. The staff of Hotel Perenika has extensive local and regional knowledge and is happy to suggest a variety of activities and destinations to suit any interest. Today the area surrounding Shipka is a national park and memorial, including the Monument of Freedom on Peak Shipka, a number of tributes to historical battles, including the stunning Shipka Memorial Church Rozhdestvo Hristovo(Birth of Christ), dedicated volunteers who died during the war liberating Bulgaria from the Ottoman Empire (only a 10 min walk from the hotel). Within a 3km radius of Hotel Perenika you can also visit the 9 mounds, tombs and sanctuaries of Thracian origin dating from more than 2500 years ago. Ratest are per person per night. At this point we unfortunately accept only cash payment. We are located 5 min from the centre of Shipka, up the road past the Post Office. We are 12km from Kazanlak and 36km from Gabrovo. There is a bus, taking you to the centre of town, which leaves hourly from Kazanlak or twice a day from the Sofia Central Bus Station.